One of the greatest aspects of being a children’s librarian is having the opportunity to use a host of mediums to inspire and connect children to a wide array of literature. The profession lends itself easily to the use of books, music, movement, and performance, but it is also lends itself to the rich exploration of art and images. One of my primary goals as a librarian is to ignite a child’s imagination, and thereby motivate them to creatively explore both their outer and inner worlds. Personally, I’ve found one of the most satisfying ways to encourage young children to flex their creative muscle, is to inspire them through the work of famous artists, in what I like to call – The Artist Workshop. My rule of thumb for creating programs is to always let a great book be the starting point for my planning. The Artist Workshop is no different. Start by selecting a children’s picture book about a famous artist, like Patricia MacLachlan’s The Iridescence of Birds: A Book about Henri Matisse, Illustrated by Hadley Hooper. This particular text is very rich and child friendly, highlighting Matisse’s inspiration and early childhood experiences. Next, pair the book with a Power Point or visual presentation of the artist’s work. You can also share short biographical films from Weston Woods, or from the internet. Allow the children to discuss the artist’s work, and explain for themselves what they see. Explain the artist’s technique, what makes their art unique, and how their work can be reproduced. After modeling the technique for the children, allow them to create artwork in the style of your selected artist. 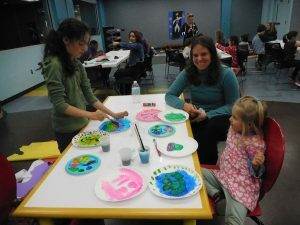 For our Matisse program, we created a large paper-cut mural and painted plates like he and his mother did when he was a child. There are lots of fantastic children’s biographies on famous artists such as Keith Haring, Wassily Kandinsky, and Frida Khalo. This summer we’ll be using the Pura Belpré honor selection Frida Khalo and her Animalitos by Monica Brown, to explore how Frida used her family pets to create distinctive art. Don’t’ be afraid to explore children’s illustrators as well, such as Beatrix Potter for watercolor, and Eric Carle and Ezra Jack Keats for collage. 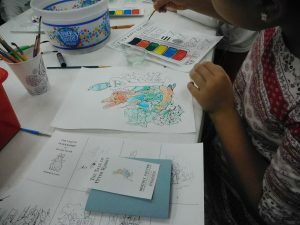 Children love emulating their favorite artists and illustrators, and your library has the perfect book to lead the way. Evan Michael Bush is the Head Children’s Librarian and Youth Services Coordinator for the Athens Clarke County Library and Athens Regional Library System in Athens, Georgia. Evan has over 19 years in elementary education and children’s librarianship. 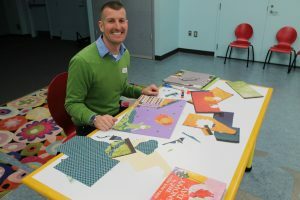 He has served three years on the Georgia Children’s Picture Book Award Committee, and currently serves on the ALSC School-Age Programs and Services Committee. 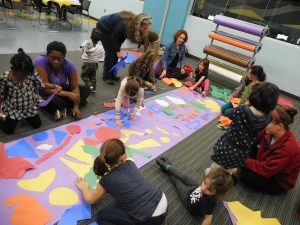 Arts For All — Arts-for-all.org — is a nonprofit arts education organization in NY which uses my mom’s “word-picture” haiku to help teach collage, drawing, and painting; theater; and music. Sydell Rosenberg was a charter member of the Haiku Society of America in 1968 and her short poems are highly visual and like little stories. The teaching artists help Bronx and Queens students “interpret” the poems via these media. It’s been an enriching experience for all. Now that her new book, H IS FOR HAIKU (with Sawsan Chalabi; Penny Candy Books) is out, I hope to continue this rewarding partnership for children.